Tall Tales is delighted to be showcasing the Award Winning ‘Chandelier of Lost Earrings’ by Manchester based artists Lauren Sagar and Sharon Campbell. 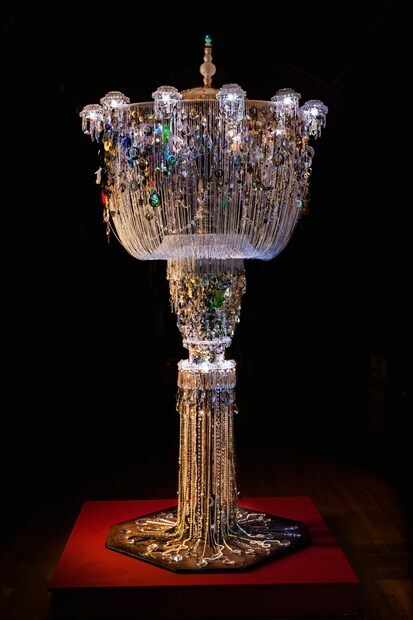 The Chandelier of Lost Earrings was initially stimulated by a collaboration with staff at St Mary’s Maternity Unit (at Central Manchester University Hospitals), where staff were asked to donate lone earrings, which had formerly been a pair, and which had some emotional resonance or significance for the wearer. A successful press and social media campaign followed, gathering in many thousands of earrings over 12 months. The act of individuals contributing something of personal value, towards a communal project to form something new, found strong resonance amongst hundreds of people (in the main women) locally, nationally and internationally. For the Tall Tales programme the Chandelier will arrive at each City/ Town prior to the full programmed exhibition, signalling the arrival of Tall Tales to the venues and acting as a talking point for initial engagement work around Lauren Sagar’s new Commission ‘Call for Cloth’. To find out more about Call for Cloth click here.